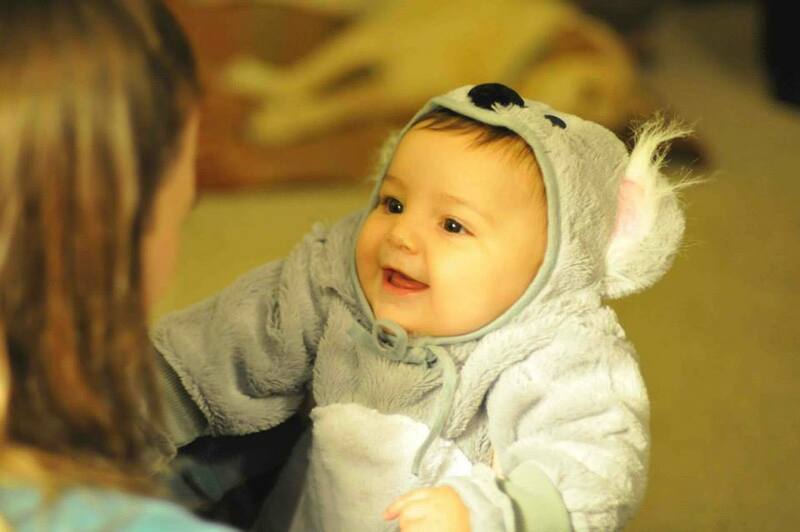 Isn’t Mary the cutest little Koala bear you ever did see? She flew to Dad’s (with her parents) from the other coast today. So excited to meet her. I’ll be checking messages so feel free to write if you need me. Back to packing! This entry was posted in Artist's Studio and tagged alex, art, artist, bear, dad, Estey, Family, flying, koala, Mary, packing, quilt, quilting, quilts, sew, sewing, sewist, thanksgiving, travel on November 20, 2013 by quiltartbymegan. My mini group is on a weekend retreat right now. I get to go play with them all day tomorrow. So fun! I couldn’t swing the hotel room and all weekend costs, but am extremely excited to spend a day sewing and chatting with some of my favoritest peoples ever. Soul food, for sure. Plus chocolate. Also, I just wanted to give you guys a heads-up that I’m going on vacation for two weeks starting at the end of next week. My plan is to continue with my two-ish blog posts a week but it may be more or less than that, depending on the number of photographs taken and the time to actually write. Hubby’s not coming with me this time but I’m excited to spend some quality time with family I haven’t seen in a long time… including one I haven’t met yet, baby Mary! Expect an update on her quilt with full photographs of it and her sweet cheeked drooly-ness either during my stay or once I get back. I’m also super psyched to spend some time with my baby brother who’s growing into a man and my little sister who’s now a mommy. And my Dad. Sorry dude that you’re last on the list of shout-outs but we’ve had some really great phone conversations recently that make me feel like you’re not halfway across the country. So, big plans for me. I’m sewing like crazy to finish up some projects before I go. Custom orders for Christmas are still available. It’s getting a little late in the season for Chanukkah, but you could always give a card saying what you’ve ordered and save the actual gift for when it arrives. Plus there are birthday and anniversary celebrations to be had. 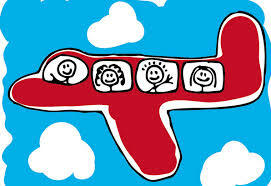 I’ll have a few more posts up next week before I land in fly-over country. This entry was posted in Artist's Studio, Quilting the Quilt, UFOs and tagged airplane, art quilts, brother, dad, day trip, Estey, Family, family reunion, friends, jim, Mary, meeting baby, quilt, quilting, quilts, retreat, retreats, sew, sewing, sister, soul food, steve, thanksgiving, two weeks, UFOs, vacation on November 16, 2013 by quiltartbymegan. Estey’s Quilt – See it Here! Ta-da! Here they are, the long awaited photographs of “Estey’s Quilt.” Isn’t it cool? This is both my latest finish and the first of the portrait quilts I’ve made. It started with a quilt show where I saw some beautiful applique quilts of a tiger’s face. Those quilts had been made from a pattern. My friend knew the perfect book when I mentioned that I’d like to learn how to make quilts like that, but from my own photographs, and to draft my own pattern. Here’s the link to that book on Amazon. It’s Faces and Places by Charlotte Warr Anderson. http://www.amazon.com/Faces-Places-Print-Demand-Edition/dp/1571200002/ref=sr_1_3?ie=UTF8&qid=1347682166&sr=8-3&keywords=charlotte+warr+anderson. 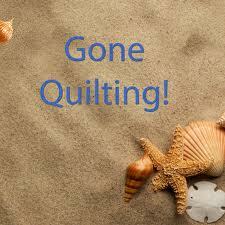 She teaches how to use the shapes and shadows from actual photographs in quilts. Her method is reverse applique by hand. So that’s what I did for this first one. It is also hand quilted entirely by hand… which is why it took so long to make. I found that I enjoyed this project so much that I wanted to make more… so I experimented with fusible webbing and machine quilting to streamline the process. So there you have it, the whats and hows. But what are really special to me about this quilt are the whys. See, Estey is my little sister. We’ve pretty much had an up-and-down relationship from day one… when I threw a tantrum that “my baby” wasn’t named Jesus. (She was due around Christmastime, and I was nearly four years old.) Recently I’ve been putting a lot of effort into remembering the good times, and appreciating the woman she is today. That’s what I was focusing on with every hand stitch. 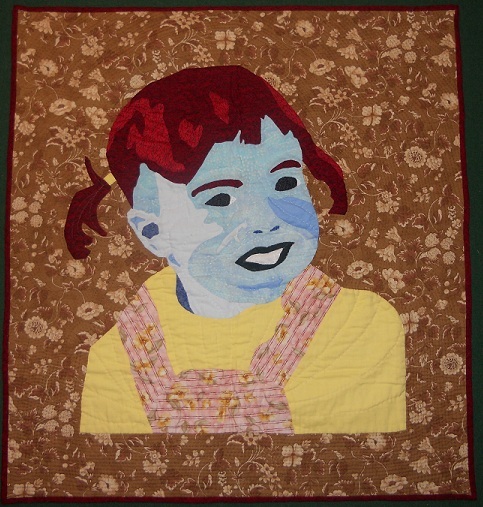 The photograph this quilt is based on was taken when she was a toddler, struggling to get out of the stroller at Grandma’s house. My baby sister is now married and expecting a child of her own. I feel like I’m not articulating this well right now, but I feel even more connected with and happy for her because of the time I put into this project. Plus it’ll be a great happy-expectations gift when I get it in the mail. 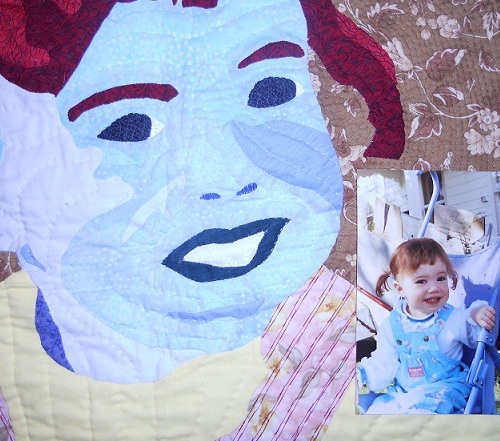 This entry was posted in Applique, Portrait Art Quilts, Quilting the Quilt and tagged art quilt, baby, Estey, expecting, Family, grandma, hand quilting, handwork, learning, portrait quilt, pregnant, quilt, QUILTArtbymegan, sister, toddler on September 17, 2012 by quiltartbymegan. How many UFOs do you have? No, not the space ships, I mean unfinished objects. 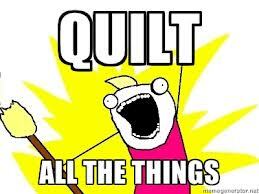 Mine are mostly sewing projects and I’m sure I have at least 30, though I haven’t done an exact count recently. This week I’ve been hopping from thing to thing, not quite satisfied to sit down with just one. Please forgive my lack of photos this time. I took them… and moved the camera away from its cord… and promptly forgot where that cord is? I know, it’s where I left it. Wherever that is. So just use your imagination for this one and I’ll get back to photos on the next post. A one block log cabin quilt with Asian prints. Decorating my work apron. We’re required to wear one, but can trick it out however we want to. I’m adding pockets, making it shorter, and decorating it with some of my crumb quilting goodness. Yes, I’ll show you guys a picture soon. Binding some place mats for the senior center. Hand quilting “Estey’s Quilt”… It’s almost ready to show you guys! I spent several hours working on this at a car show. Thankfully, my husband recommended bringing along some handwork. I’m so glad he did because it would have been beyond boring for me without it! Planning out a birthday present for my baby brother. He’s turning 14. I know, not really a baby anymore but he’s still my baby. And, of course, working on the 4 subjects piece I wrote about in my last blog post. Whew! I don’t know why I’ve been project-hopping like this but I’ll just go with it for now, especially since I don’t have any big deadlines coming up quickly. I’ll just enjoy dabbling in everything. This entry was posted in Applique, Binding, Crumb Quilting, Free-Piecing, Portrait Art Quilts, Quilting the Quilt, UFOs and tagged apron, art quilt, binding, birthday, brother, car show, choosing colors, choosing fabrics, Estey, Family, handwork, improvisational piecing, log cabin, Megan, organizing, plan the project, portrait, portrait quilt, QUILTArtbymegan, UFOs, Unfinished Objects, wedding on September 3, 2012 by quiltartbymegan.